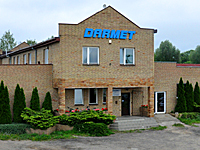 The "Darmet" company was founded in 1988 in Bialystok. Currently, we are located in a modern building with an area of over 1500 square meters. We are a factory producing goods for engineering industry and mining. Most of our products are exported to Western Europe and the United States. We have modern machinery - CNC machine tools and a well-qualified staff at management and production level as well. We have many years of experience in the production of machine vices and swivel precision vices, back plates for lathe chucks, edge finders and ball valves. Each year our company is expanding production and marketing of its new products. Our products are manufactured under ISO 9001 quality management. We guarantee high quality of our products and stable cooperation to our customers. Since 2008 we have begun commercial operations, which primarily involve the sale of tools and equipment for machining. We are the sole representative of the German company Kennametal in north-eastern part of Poland. We also cooperate with Allied Engineering Company Maxcut, Rineck, Fenes, Fanar, Bison-Bial, and many others. We constantly expand our sales offer to provide optimum service to our customers. Many years of experience, modern machinery and a well-qualified staff provide professional service and prompt execution of your orders. We invite you to cooperation.